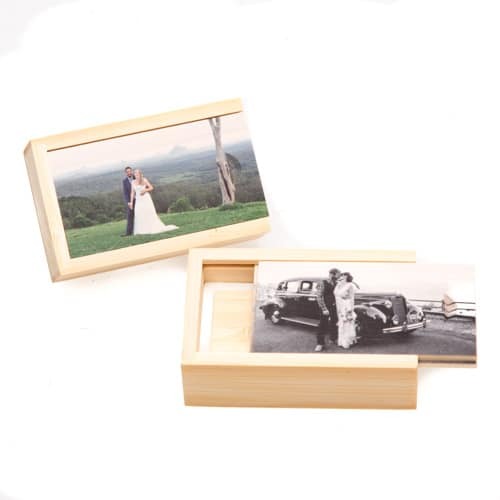 Create a Photo USB Box set your customers will love it! 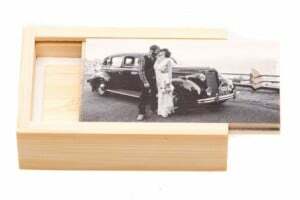 Create a photo USB box set your customers will love, choose your clients favorite photo and have it printed onto a bamboo box with a matching USB memory drive. 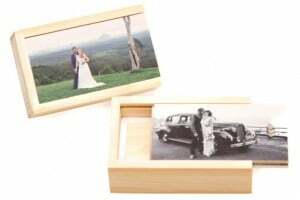 The custom printed photo USB Box set makes the perfect keepsake for your clients, they will treasure it for years to come and you will have the perfect packaging for delivery of your digital files in your business. Our Bamboo USB box and memory flash drive will be custom printed just for you. All of our USB’s are checked in house and printed locally, ensuring you get the luxury and quality you would expect. Choose from our range of USB sizes depending on the quantity of images or data you are providing, we have 1GB, 4GB, 8GB and 16GB available and in stock. The lid of the USB box will be printed edge to edge it slides smoothly on the top of the box and is held closed by a small magnet. You can choose to print just the body of the USB or the full USB and lid, each USB has two small magnets to clip and hold the lid in place, ensuring your image looks fantastic. All we need is a landscape orientation JPEG file sized to fit the lid of the USB, refer to the product description for all the details here. You will be able to upload your file digitally before you add the product to your shopping cart. We hold plenty of stock on hand, so your photo USB and box will be printed within 5-7 business days from the time you place your order. You can also choose your shipping method at checkout, be sure to choose express if you are in a hurry and let us know so we can do our best to meet your requirements.